Mission Info modifies the mission tracker on the right side of the screen. 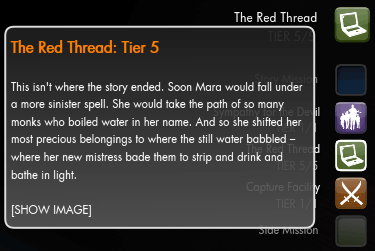 When you hover over a mission's icon or text, you'll get a tooltip with the flavor text of that mission's current tier. Additionally, clicking on the currently active mission's icon will show any associated image, video, or audio clip. The Mission Journal can be opened by selecting the active mission in the mission bar (the part that auto-hides). * Fixed failure to initialize properly when switching characters. * Rewrote completely so that this addon does not replace any Funcom components. It is now much smaller and should not need updated with each game patch. it will toggle the Mission Journal window. * Updated to the 1.9 source code. * Fix Mission Journal popping up when zoning. * Updated to the latest source, bringing in whatever fixes FUNCOM has made. * The fonts now match the game's more closely. * Tooltips now show up for all missions in the sidebar. * The mission journal can be opened by selecting the current mission in the auto-hide section.